Let’s say you are offered a clear little pill that would allow you to access the full potential of your brain. Would you take it? 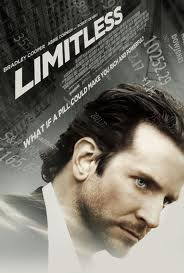 If you are the protagonist of Limitless - an unkempt and down-on-luck writer with a writer’s block the size of a polar cap, you certainly would. So you pop the pill and wait. The pill, apparently, makes your brain very, very fast. Then what? To save you the trouble of watching the film (please let me save you that trouble!) I’ll give you a summary. You will clean you apartment, get a haircut, buy a great suit, exercise yourself into stunningness. Then you’ll write your novel in four days. You will acquire languages seamlessly, and then used them to impress your ex-girlfriend in ethnic restaurants. You will abandon writing books for a clearly more intelligent choice of investment banking. You will outpace your bosses. You will enter social circles you have only dreamed about, and sleep with a variety of exotic beauties. You will know everything about everything. You will be able to street fight eight men at the same time. You will make an awful lot of money. And in the end, you might just become the president. Don’t get me wrong - I am not blaming the movie, I am blaming my expectations. I was expecting a movie about a struggling writer who, with some chemical help, reaches full human awareness, and gets his novel finally done. I know, it’s unwise to search for inspiration, or insight, or tips (what’s the name of those chemicals?) in a movie. What did I think it would be, after all, Matrix for struggling writers? But being subjected to an adolescent boy fantasies for an upward of ninety minutes is too severe of a punishment for that mistake. If you like the genre, you can save yourself time and money and watch an MTV video instead. But don’t let me put you off, especially if deep inside, you really, really want to be the president.